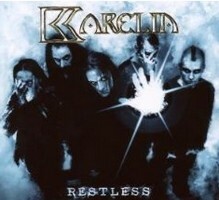 The French band Karelia changed their sound dramatically, so if you are a fan of their first 2 albums, then Restless will disappoint you. Okay, if you are open-minded and also into electro goth, then you might dig this, too. I have no idea why the French changed so drastically, but well... They open up their album with the heavy goth rocker Restless. The vocals of Matt Kleiber are seems to come from a distance, but then the band adds some heaviness and Monsieur Kleiber takes the focus with his melancholy vocals. The song is catchy and well chosen to start into the new world of Karelia. With the following Trial they drift more to electro sounds and most metal fans won't like this tune. It reminds me a bit of some 80's electro pop song - but with some trance elements. With danceable beats this one might find its way into some electro gothic / EBM dance halls. The dark gothic metal tune Mirror, Mirror is presenting crunchy guitar riffs, majestic vocals and a catchy refrain. The whole CD is just shy of 38 minutes running time and so I don't really understand why they recorded 2 cover versions, even if Moby's Lift Me Up and R.E.M. 's Loosing My Religion are well done - even if they sound quite different! On Crash singer Matt Kleiber can show again his emotional side and he's the strong point in Karelia. At From My Window they start with metallic guitar riffs, but then the song tends more towards gothic rock with some electronic sounds. Well, I'm not sure, if this album will find its listeners... In my opinion they should have renamed the band and re-start. Their new target group is the electro gothic scene, but if they can convince that audience only time will tell. The album gives me mixed feelings. Some stuff is cool, but the album isn't homogenous. And I'm also not sure about the intention of the band and why they did Restless... Looks like I have to talk to them to get some answers... I can just recommend to listen to several tracks and to make up your mind.